"The route from Siem Reap to Battambang with boat is said to have beautiful scenery and worthwhile trip if you have time. Bus is cheaper and takes only two hour. Boat takes 3 hours in high water time and up to eight hours during low water time." Siem Reap to Battambang Daily ferry departs Siem Reap for Battambang at 7:30am. $25/person. It's a picturesque, 4 - 6 hour journey across the Tonle Sap and up the Sangker River in the wet season, but can be considerably longer (8-11 hours) in the dry season due to low water levels. Ask about current conditions. The boats in no way meet international safety standards. 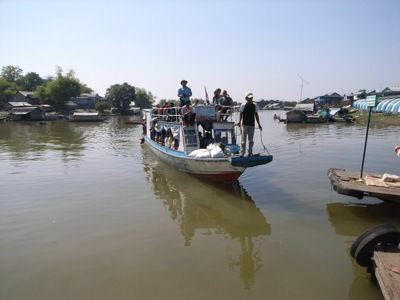 There is no direct boat between Battambang and Phnom Penh. "It was mid February 2011 and the water levels made the trip very long. Do not believe hotels at either end, who tell you the trip takes 5-6 hours. This was close to a 12 hour trip. There was a 6am pickup at the Battambang hotel and we had to wait 1 hour at the tour office (good chance for breakfast). Also an 1 hour bus ride to boat. From 8am to 1am on the boat crossing lake and upriver. We saw a very interesting local life and bird life. There was not too much problem with water levels. Then we had a stop for 20 minutes lunch at floating roadside restaurant. From 1:30 to 4pm there was a big struggle to get a big long boat up a small river. Much help was required from passengers to man poles to fend off the banks and two groundings needing volunteers to jump into river (now less than knee high) to push boat off. At 4pm we disembark in the middle of nowhere to squeeze 24 people plus all possessions into a regular Toyota pickup for 1 hour across fields and down and over ditches on a track to an unmade road. Then about 45 minutes into Battambang. Big joke was that they said they could only take 3 passengers in front because of regulations. I'm guessing 20 more on the back wasn't really very safe anyway! This is not for everyone. You need a real sense of adventure and patience (and earplugs for the boat engine and plenty of water). I loved it. Would I do it again tomorrow - no. Would I do it next time in Cambodia - for sure". "The highlight of Battambang is the journey itself from Siem Reap. We'd been informed that there was a fast and a slow boat so we forked out $25 for the fast boat that we'd been informed would take 5 or 6 hours. We were collected at 6am at our hotel and taken in a packed little minibus to the port of Siem Reap, where you'll see some really poor conditions in the housing approaching the quay. We were most unimpressed at the vessel that awaited us. It had certainly seen better days and as more and more minibuses appeared they just packed everyone onboard until there wasn't another space to be had. At least we arrived early and got a seat on the lower deck. The last arrivals were boattairs where they would spend the whole journey in direct sunshine without shade. 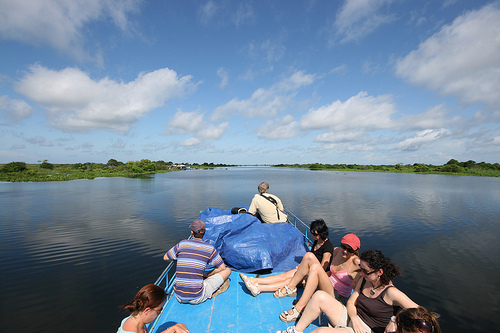 The boat left at 7am departing through the Flooded Forest and across the top of Lake Tonl� Sap. The scenery was stunning as was the birdlife all around us. It was only when another boat heading in the same direction cruised past us that we realised that we were on the slow boat to Battambang. With hindsight I preferred the slow option as the fast boat looked closed in with windows whereas we got some breeze thanks to the open seating area. The fact is that neither boat was satisfactory in terms of comfort or safety but I'm sure we enjoyed a more fascinating journey than if we'd been locked inside the other boat. There are buses that do the same route but road conditions are very poor making for a similar journey time. The whole journey was fascinating as we really got to see rural Cambodia and life on the river. We finally arrived in Battambang more than seven hours after we'd left Siem Reap and were collected by a minibus from the Hotel which we'd pre-booked. The hotel might not be anything special but I'd highly recommend it. The owner is extremely friendly and helpful and the rooftop bar/restaurant is fantastic".